Large 4-bedroom family home plus a separate multi-purpose area. This beautifully presented 4-bedroom, 3-bathroom home offers your family a home with an abundance of natural light, cross flow ventilation and a very pleasant outlook to a nature reserve. The main home is located over two levels with the main living areas at street level and bedrooms are on the first level. The street level consists of a huge double garage with remote control doors, extra space for storage and direct access into the home. There is a combined formal lounge and dining room that features, air conditioning, cathedral ceilings and opens to a private courtyard area. A large functional kitchen with new benchtops, an electric hotplate & oven, range hood, dishwasher and bay window with a view to the back yard. Next to the kitchen is a separate laundry and powder room. The meals area is combined with the kitchen and opens to a massive, covered entertainment balcony with a split system air conditioner. There is a second living area or rumpus room that also opens to the entertainment balcony and features a split system air conditioner. Up the stairs, to the first floor, you have a large master suite featuring a walk-in robe, ensuite and a separate breakout room that could serve as a study or baby nursery. Down the hall are three other large bedrooms all with built in robes, good sized bathroom, and separate toilet. Carpet to all bedrooms and ceiling fans. Great crossflow ventilation from the elevated position. The entertainment balcony faces North so have the benefit of winter sun and natural light. The back yard is fenced with access to the adjoining nature reserve which features a park-like grassed area and bushland. There is a new electric hot water system and a 2.0 kW solar power system. Directly below the home’s main living areas and balcony is a massive multi-purpose room that is 16.2m x 6.7m in area. This room is separate to the main home and can be accessed from a side path entry to the backyard. The practical uses for this area are many. There is a toilet, shower, and vanity and washing machine facilities located in the multipurpose room. Only a short walk to schools and bus stop. 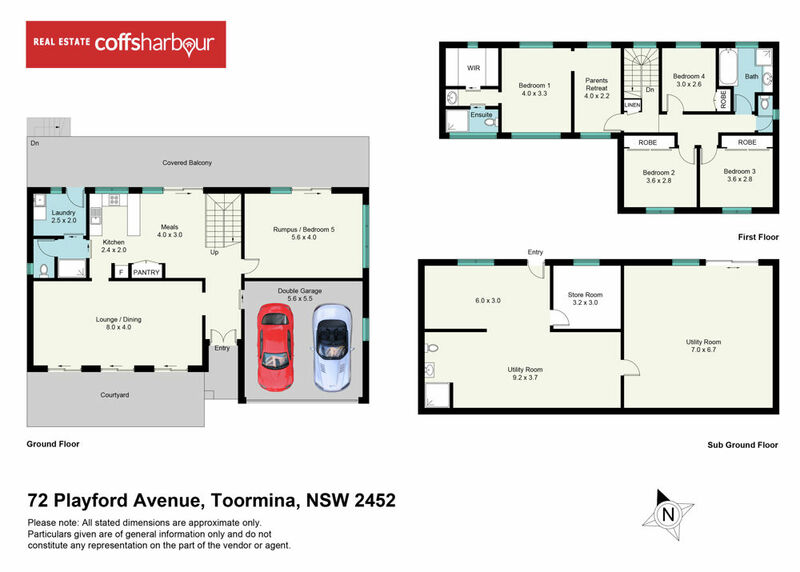 Easy drive to Toormina Gardens Shopping Centre, Bonville Creek, and Sawtell Beach. Solid brick construction and terracotta tile roof this home offers great value for money and there are so many options for either an extended family area or home business.